You are here: Home / Recipes / Breakfast / Overnight Southwest Breakfast Casserole and Crock-pot Giveaway! 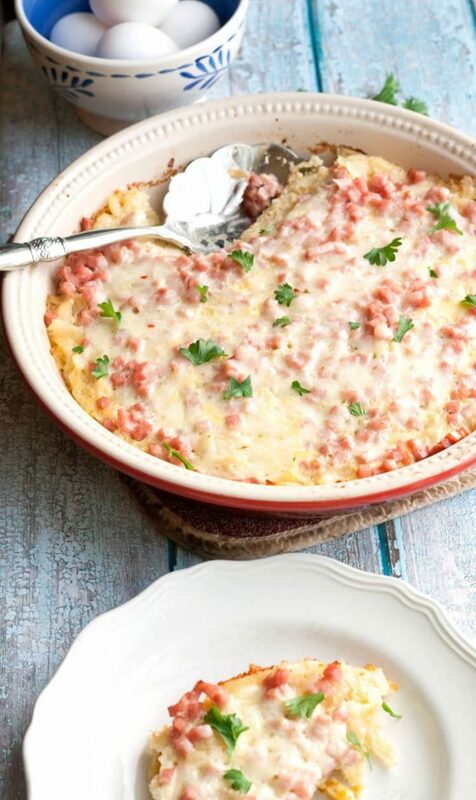 Overnight Southwest Breakfast Casserole and Crock-pot Giveaway! Making breakfast should be easy, right? I’d sure like to think so. Well, here is one way to help you out with making breakfast even easier–and it doesn’t involve skipping breakfast, not making breakfast or pouring a bowl of cereal. In fact, I’ve come up with an amazingly delicious breakfast dish that literally takes 5 minutes of prep time! That’s all. And then, you can either set your Crock-Pot timer (like the Crock-Pot we’re giving away) or you can put it in an oven-safe dish and be ready to get up with enough time in the morning to bake the casserole for about 30 minutes. Yep. Personally, the Crock-Pot timer sounds a WHOLE lot better. Because, lets face it–sleeping in an extra 30 minutes is a no-brainer. At least when you stay up until 12:30 in the morning watching Netflix. That happens a lot in our house. All She Cooks is all about whipping up simple meals, and this one takes the cake. It’s a savory breakfast dish that would also be perfect to serve at a brunch or potluck. It’s mixed up with a compilation of breakfast ingredients, but is pulled together so quickly by using a bag of Simply Potatoes Hash Browns. There are a few varieties of Simply Potatoes, but we used the Southwest Style Hash Browns to compliment this recipe. Since I had another bag of Simply Potatoes Hash Browns on hand, I decided to thrown them in a couple of the pictures so you can see what the product looks like. It’s a great way to get a visual so you know what to look for at the store. Simply Potatoes are found in the refrigerated section in the grocery store, normally right over in the dairy section. Now, I know that isn’t where you would expect to find potatoes, but trust that these potatoes are so good, and will save you so much time in the kitchen! Simply Potatoes is made by the folks over at the Crystal Farms Company. And, if you’re at all familiar with Crystal Farms (which I’m sure you are), you know they make great-tasting, high-quality cheese, eggs, butter and English muffins. And, like I said… they are located in the dairy section at your local grocery store, so they are easy to find whenever you have a recipe that calls for yummy potatoes or has browns. Some of the best recipes I can think of using Simply Potatoes involve easy slow-cooker recipes. And we all know that easy slow-cooker meals make life so much easier. Especially on busy school nights full of homework battles or extra-curricular activities. And our house is no different that yours. In fact, I came home last night at about 9 pm, straight from running an errand to Home Depot to purchase a new microwave because ours is on the fritz and a bunch of paint because our upstairs is WAY overdue for a fresh coat. So, my point in all this is that we are all BUSY. I was seriously home long enough last night to clean up all of that mess–and only then because if I walked past it one more time I was going to probably quite literally pull my hair out and go crazy. I get it. In between kids, work, TRYing to keep a house organized, and all the kids activities–where in the world is there time to do more than prepare an EASY meal? Which is why I am ALL about focusing on the ease of meal prep. 5 minute meal prep. That is all this recipe took. And it was fresh, tasty and just as good the second day. Ready for an Awesome Giveaway? Want to win a Programmable Carry Cooker Crock-Pot? Leave a comment below telling us what Simply Potatoes Cut Potatoes flavor you’d like to try. Have a 5 minute meal prep idea for a yummy potato Crock-Pot recipe? We’d love to hear that too! Leave a second comment with your Crock-Pot recipe idea for a second chance to win. Spray crock with cooking spray. Pour potatoes into crock, top with ham. Whisk eggs together with milk and pour over potatoes and ham. Top with shredded pepper jack cheese. 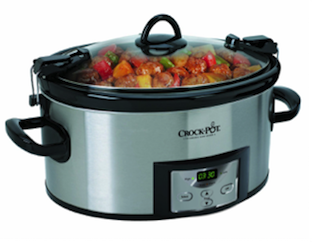 Set Programmable Carry Cooker Crock-Pot to start cooking 4 hours before you'd like to serve. Cook on low. Method 2- Prepare as in method 1, except use a baking dish. Cover with foil overnight and then place dish in cool oven, set to 350 degrees and bake for 30 minutes. Make sure to put cool dish in cool oven so dish will warm up slowly and not break. Want some more recipe ideas? Check out Simply Potatoes Recipes and Simply Potatoes on Pinterest. Would love to try the Southwest variety. I like to cook, potatoes with smoked sausage, jalapenos, onions and cheese. the shredded hash browns are great to use, and the southwest are very good. That looks so good. I would love to try the Cheesy Hash Brown Cups with the diced with onions! Perfect for on the go breakfast and lunch! I would like to try the Southwest version. I would love a chance to win this!! I would like to try Simply Potatoes Diced Potatoes with Onion. I( am most interested in trying the rosemary and garlic red potato wedges,. I want to try the Simply Potatoes Southwest Style Hashbrowns. My kids love hashbrowns and that flavor we have not had yet. Crock pot jalapeno, chicken & sweet corn soup is delicious and quick to make! I’d Like To Try The Southwest Style Hashbrowns. My Recipe Idea Would Be For Southwestern Potato Soup. I’d like to try the Southwest Style Hash Browns. I have a great idea. I usually make this with cut up fresh potatoes but you could just use these Simply Potatoes. It’s so easy just add the potatoes, diced ham, cream of mushroom soup, shredded cheese and some garlic salt. My family loves when I make this. I’d like to try the Traditional Shredded Hash Browns. I’d really like to try the diced potatoes with onion. I would like to try the Southwest Style Hash Browns! The Southwest Style Hash Browns sound delicious! I would love to try those first. Sounds so easy and delicious! I want to try that southwest flavor! I want to find a crockpot chicken recipe my husband will like. I don’t think he’s liked any chicken I’ve made in the crockpot! I really like the Southern Style Hash Browns.